Curbing your smoking habit can surely improve your life and make you live healthier. Quitting cigarettes can be very tedious as it requires desire, determination, and commitment, but the outcome is very satisfying. 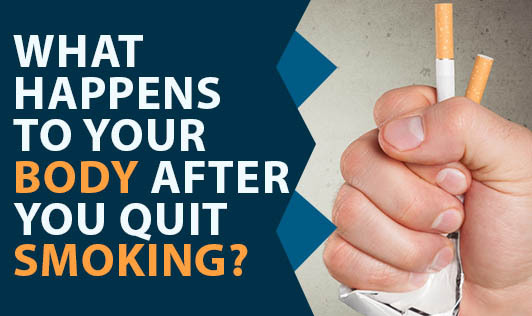 When you quit smoking, you will experience immediate and long-term benefits. • Within 20 mins: Heart rate and blood pressure drops. • After 12 hours: Carbon monoxide blood levels drops to normal. • Within 48 hours: Nerve endings begin regrowth & your ability to smell and taste improves. • Within 2 months: Blood circulation improves; walking becomes easier, lung function increases. • Within 9 months: You will see significant improvements in cough, sinus congestion, fatigue and shortness of breath. The tiny cilia hairs in your lungs will regain function, which will allow your body to handle mucus and clean your lungs, reducing the risk of infections. • After 1 year: Your excess risk of coronary heart disease is decreased to half that of a smoker. • After 2 years: Your chance of achieving long-term success with quitting tobacco increases significantly. • After 5 years: Stroke risk is reduced to that of people who have never smoked. • After 10 years: The risk of lung cancer drops to as little as one-half that of continuing smokers. The risk of cancer of the mouth, throat, esophagus, bladder and pancreas decreases. Also the risk of ulcers decreases. • After 15 years: The risk of coronary heart disease is now similar to that of people who have never smoked and the risk of death returns to nearly the level of people who have never smoked. • Physical appearance: By not smoking, former users no longer have the smell of cigarette smoke in their hair or on their clothes. Yellowing of the fingers or nails also go away after smoking cessation. • Pregnancy: When pregnant women quit smoking, they are reducing the risk of low birth weight babies. Low birth weights of infants have been linked to death, learning disorders and physical problems. • Passive smokers: After you quit smoking, people who are exposed to your second-hand smoke will be benefited with reduced health risk such as lung cancer and heart disease.